BEIJING, Oct. 18 (Xinhua) -- The Communist Party of China (CPC) has rolled out the "Thought on Socialism with Chinese Characteristics for a New Era" and embarked on a journey to build a "great modern socialist country" as its 19th National Congress opened Wednesday. 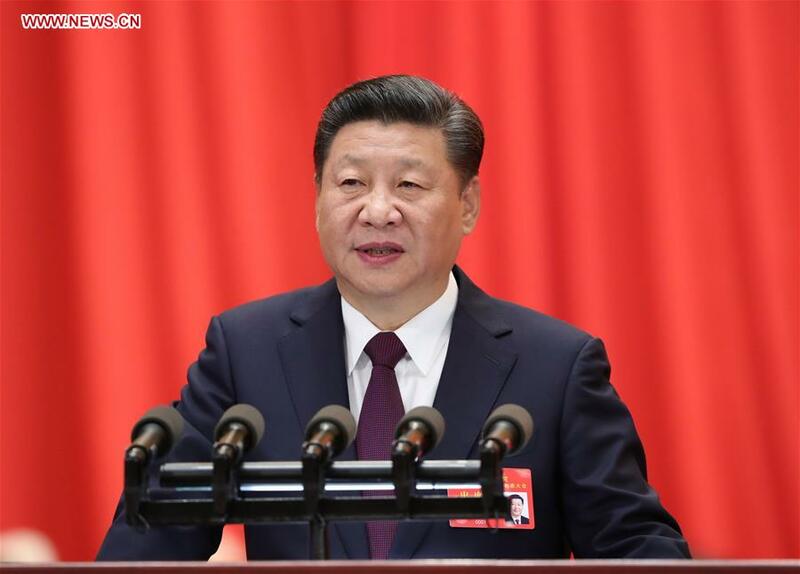 Delivering a report at the opening session, Xi Jinping outlined a two-step approach to build China into a great modern socialist country after the completion of building a moderately prosperous society in all respects by 2020. Hailing the historic achievements in reform, opening up, and socialist modernization in the past five years, Xi said socialism with Chinese characteristics has crossed the threshold into a new era. "This is a new historic juncture in China's development." According to Xi's report, China will see that socialist modernization is basically realized from 2020 to 2035. From 2035 to the mid-21st century, China will be developed into a great modern socialist country that is prosperous, strong, democratic, culturally advanced, harmonious, and beautiful. By then, China will become a global leader in terms of composite national strength and international influence. Common prosperity for everyone will be basically achieved, Xi told more than 2,300 delegates attending the country's most important political meeting in five years. The two-step approach is an important component of the new Thought, a long-term guide to action that the Party must adhere to and develop. The Thought builds on and further enriches Marxism-Leninism, Mao Zedong Thought, Deng Xiaoping Theory, the Theory of Three Represents, and the Scientific Outlook on Development. It represents the latest achievement in adapting Marxism to the Chinese context, Xi said. Xi listed a 14-point basic policy that underpins the endeavors to uphold and develop socialism with Chinese characteristics in the new era. The principal contradiction facing Chinese society has evolved to be that between unbalanced and inadequate development and the people's ever-growing needs for a better life, Xi said. Now the needs to be met for the people to live a better life are increasingly broad. Not only have their material and cultural needs grown, their demands for democracy, rule of law, fairness and justice, security, and a better environment are increasing, Xi said. The report draws up a roadmap of developing a modernized economy and socialist democracy, building stronger cultural confidence and improving the people's wellbeing. "We must regard as our goal the people's aspirations to live a better life," Xi said. The CPC is the highest force for political leadership, Xi said, stressing strict governance over the Party and improvement of the Party's ability to govern and lead. Having gained overwhelming momentum in its fight against corruption, the Party is determined to secure a "sweeping victory" over "the greatest threat" to the Party. The congress will deliberate and adopt an amendment to the CPC Constitution. It will also elect the Party's 19th Central Committee and Central Commission for Discipline Inspection. The congress, held in the gigantic Great Hall of the People in central Beijing, was presided over by Li Keqiang. China has entered an era with the greatest composite national strength since the Opium War of 1840 which plunged China into the darkness of domestic turmoil and foreign aggression. Established in 1921, the CPC founded the People's Republic of China in 1949 and started the reform and opening up from the late 1970s. Over the past five years, China's GDP rose from 54 trillion to 80 trillion yuan (8.2 trillion to 12.1 trillion U.S. dollars), contributing more than 30 percent of global economic growth. More than 60 million people have been lifted out of poverty. China launched over 1,500 reform measures, establishing general frameworks for reform in major fields. The country is also building world-class armed forces. The Chinese nation has stood up, grown rich, and become strong, and it now embraces the brilliant prospects of rejuvenation, Xi said. "Scientific socialism is full of vitality in 21st century China." It also blazes a new trail for other developing countries to achieve modernization, and offers Chinese wisdom and a Chinese approach to solving the problems facing mankind, he said. But China is still and will long remain in the primary stage of socialism. Its international status as the world's largest developing country has not changed, Xi said. Xi reaffirmed China's commitment to building a community with a shared future for mankind. "No matter what stage of development it reaches, China will never seek hegemony or engage in expansion."